9+ Fun Outdoor Activities, Attractions, & Things to Do in Branson! Tucked away in the heart of the Ozarks’ mountains and forests, Branson, MO is one of the country’s most popular vacation spots – offering LIVE shows, shopping, and some incredibly fun outdoor attractions and things to do! Surrounded by three lakes (Lake Taneycomo, Table Rock Lake, and Bull Shoals Lake) and sitting in the middle of the Ozark Mountains – Branson and the surrounding area offers an incredible variety of outdoor activities for all ages! Whether you want to take in the beautiful sights on one of the many sightseeing tours of Branson, cruise one of the lakes, zipline through the treetops, or simply want to take in the natural beauty of the area – you’ll find no shortage of things to do outside the next time you visit! Branson’s new SnowFlex at Wolfe Mountain is the largest synthetic snow tube attraction in the United States! 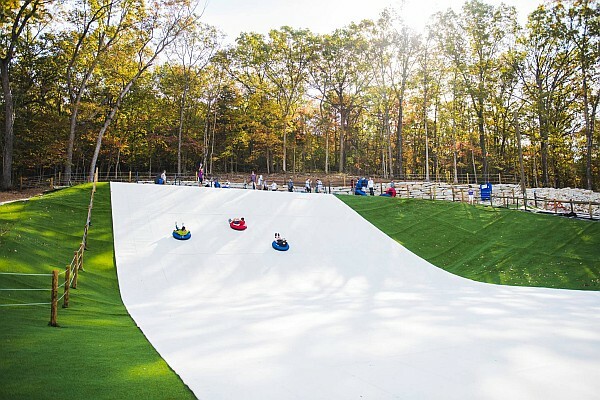 Located at Wolfe Mountain just north of the main city center of Branson, SnowFlex is the largest synthetic snow tube ride in the United States! Experience the thrill and excitement of snow tubing as you zoom down a specially-built mountain that has been covered in synthetic snow – allowing visitors a fun tubing experience year-round! Special conveyors move riders and tubes from the bottom to the top of the mountain, so you can make the most of your time and squeeze in as many rides during your alotted time! Branson’s Runaway Mountain Coaster is thea area’s original alpine coaster, taking riders on an exhilarating ride through the Ozark forests and alongside the Adventure Park’s mountain. 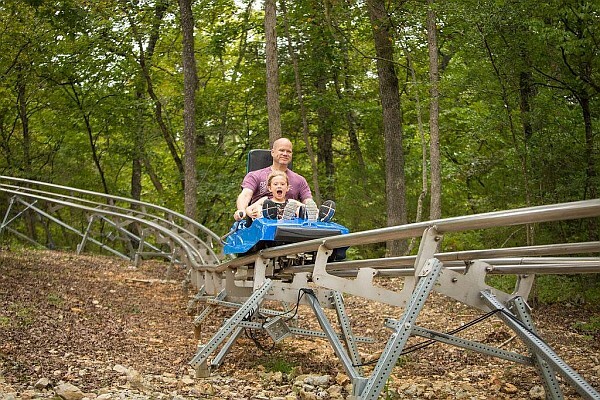 Branson’s original Alpine coaster, the Runaway Mountain Coaster at Branson Mountain Adventure Park allows you to experience the thrill of slowly ascending the side of the mountain before zooming, twisting, and turning down through the trees and Ozark countryside! Riders can ride solo or tandem if bringing the kids, and experience a one-of-a-kind, memory-making activity you won’t ever forget! If you’ve never experienced a mountain coaster, then this is definitely something you need to add to your list of things to do in Branson! Take a duck ride tour through Branson and splash into Table Rock Lake! One of Branson’s most popular and longest-running sightseeing tours, Branson’s Ride the Ducks take guests on a fun and insightful tour through the area before splashing into the waters of Table Rock Lake! The Branson area offers more than a half-dozen ziplines and attractions for all ages, skill levels, and tastes! There is perhaps no better way to see the beauty and natural setting of the area than by zipping through the treetops of the Ozarks’ famous forests! One of the country’s premiere zipline destinations, Branson now offers more than a half-dozen different zipline attractions! 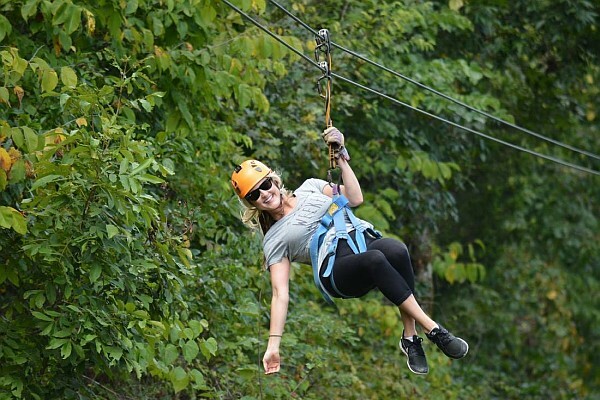 Guests looking for a more leisurely (yet still thrilling) zipline adventure – can ride the Vigilante ZipRider that launches from the top of Shepherd of the Hills’ Inspiration Tower or zoom across the waters of Lake Taneycomo at Parakeet Pete’s Zipline! Those wanting the full ziplining experience have several different options to choose from, including: Adventure Ziplines’ Tour, Branson Ziplines & Canopy Tours at Wolfe Mountain, or Indian Point Zipline’s outdoor adventure! Although indoors, we should also mention the Fritz’s Adventures ropes course offers a new and exciting option that visitors have fallen in love with! 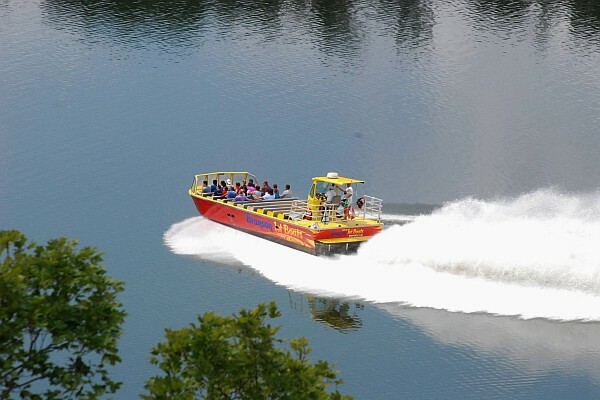 Cruise the waters of Lake Taneycomo as these super-fast boats take you down the famous waterway! 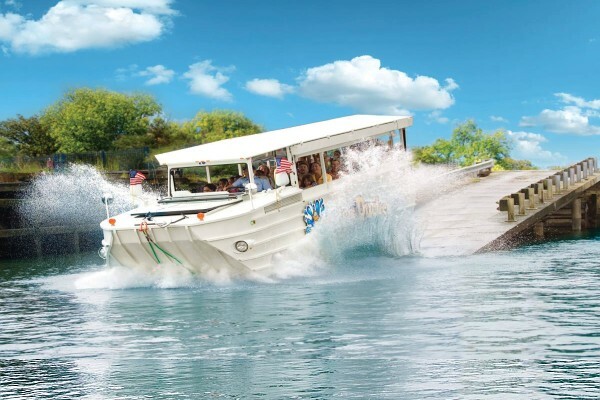 Tour the waters of the famous Lake Taneycomo in this one-of-a-kind ride that combines a sightseeing cruise and thrill-ride adventure in one! Zoom down the waters in these jet-powered boats as they twist, turn, dip, and spin while your professional boat captain shares stories and history of the area! The jet boats are a high-intensity activity, prepare to hang on tight! Shepherd of the Hills’ new ATV rides offer guests an exciting off-road adventure! Take part in an off-road adventure at the new Shepherd of the Hills Adventure Park! 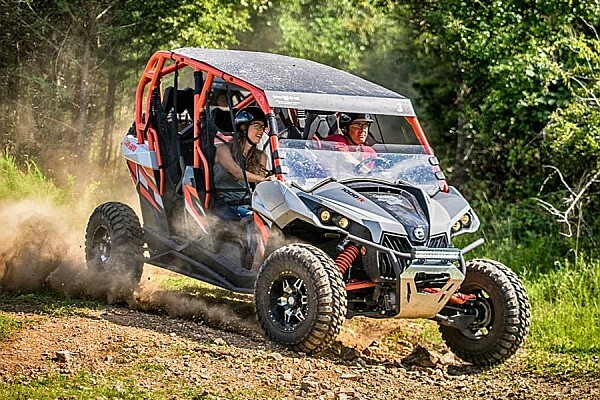 Rent one of these ATVs and go on an unforgettable ride through the mountains and forests as your guide takes on a memory-making thrill ride you won’t ever forget! Branson offers many fun and challenging mini golf courses like Shoot for the Stars and Grand Country’s Outdoor Farm Mini Golf! Fun for all ages, there are several fun and exciting mini golf courses in Branson! 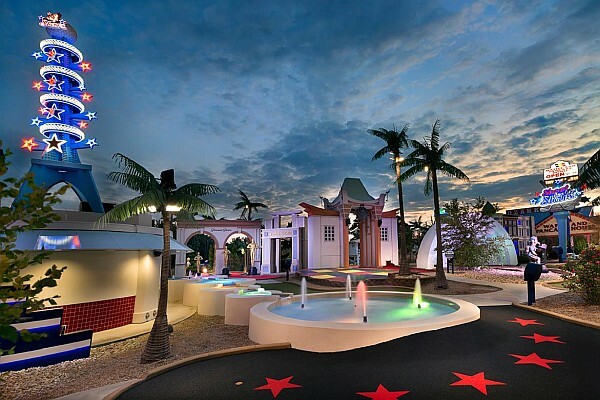 The kids will love Grand Country’s Farm Mini-Golf and the Shoot for the Stars mini golf course at the Hollywood Entertainment Center provides a unique, fun, and challenging course for those wanting to experience the sights and sounds of Hollywood and Beverly Hills! 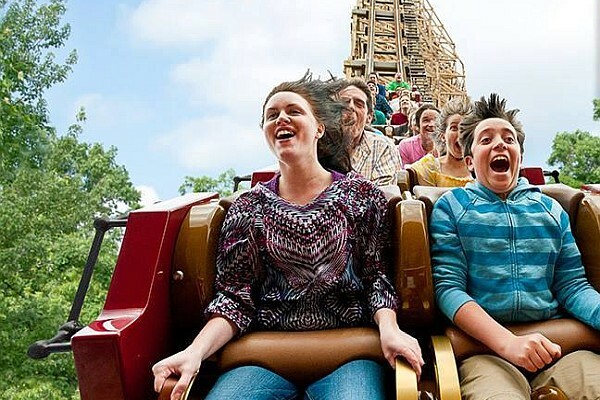 Silver Dollar City is Branson’s most popular attraction – featuring roller coasters, food, LIVE shows, and dozens of things to do! Branson’s most popular and visited attraction, the 1800s-themed Silver Dollar City amusement park has something for everyone! Most of the famous park’s attractions and things to do are located outside, offering a great way to spend a day outside while riding roller coasters, eating some incredible food, taking in some of their LIVE entertainment, and creating memories that you won’t ever forget! White Water is Branson’s largest water park, featuring 12 acres of outdoor fun, slides, tubes, and pools! The area’s largest outdoor water park, White Water offers something fun for all ages! The youngest visitors can splash around in the special kids’ area while all other guests can experience the slides, tube rides, and pools designed for nonstop fun in the sun! Open during the warmer months, Branson’s most popular water park provides a great way to spend some time outside when you’re visiting! 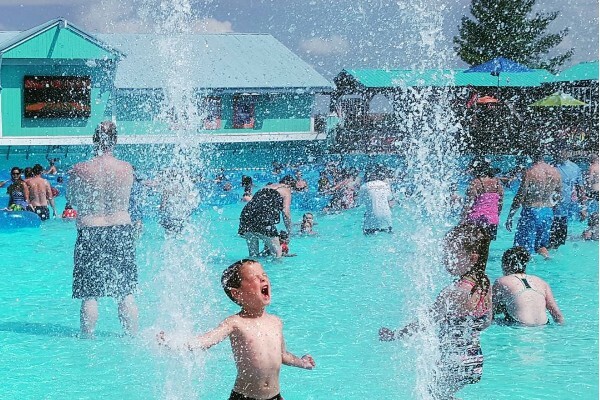 For those wanting to visit both Silver Dollar City and White Water – we offer special Splash and Play passes that allow you to visit both parks with incredible savings!